The largest events on the planet are all sports related - FIFA World Cup, the Olympics and Tour De France to name a few. Professional sports management is an integral part of a multi-billion dollar global industry. It spans everything from the management of elite athletes and major teams to the administration of mass market, mass participation sports and the myriad of industries and government bodies that support them. The business of sports management requires people with skills across many areas, including management, marketing, law, finance, commercial development, sponsorship, event management, player and performance management, coaching, psychology, human performance and health. At ICMS we are connected with industry. We work with sports industry professionals including those from the fields of sports law, media, psychology and nutrition, to maintain our high standards of excellence in curriculum design. Our Bachelor of Sports Management degree continues to be relevant to industry as we review and refine it to ensure our students have the best specialist knowledge in sports management to work anywhere in the world. When you graduate from ICMS you’ll have more than just a degree. Built into your qualification is 600 hours of industry experience. Our industry training consultants will help place you in an organisation relevant to your studies so that after your degree you’ll have an impressive CV, a network of contacts and a significant advantage over other graduates. Theory is important, it will teach you the fundamentals you need to be a sports management leader. However, nothing is as valuable as putting theory into practice. In addition to your industry training, you’ll gain hands-on experience working on real events. Field trips and site visits with our industry partners will see you learning from the best in the business. This degree is far more than a sports training program, we train you to be a leader in the sports industry. Combining specialist sports subjects with business, we train you in the critical thinking and analytical skills you’ll need to prepare for a management role after you graduate. At ICMS we have lecturers with international careers who are experts in the sports industry. Guest lectures from our network of industry partners such as sports psychologists, consultants and nutritionists, will keep your learning fresh, relevant, and up to date with the latest demands from industry and your future employers. At ICMS we are in the business of training extraordinary sports managers. Our graduates are experts in sports management principles, are technically skilled, and have a working experience of the industry. Our Bachelor of Sports Management graduates are trained to be professional leaders. Whether you dream of standing on the sidelines at the Super Bowl or watching your athlete claim gold at the Olympics, ICMS will provide you with a superior education in sports management theory and practice that will prepare you for a leadership role. ICMS degrees focus on the next generation of education, getting you job-ready by embedding industry training and practical experience into each degree. To be an exceptional sports manager you need to have a sound knowledge of the sports industry in practice. The best way to do that is to experience it first-hand. Here are some of the unique ICMS experiences that will get you out of the classroom and into a successful career in the sports industry. From locker rooms to boardrooms, ever wondered what it is like behind the scenes at some of your favourite sporting venues? You’ll meet with industry management experts and learn about the business of sport from the inside with site visits to sporting venues like the Sydney Cricket Ground. You will examine the business functions of professional sports venues. Reflecting on your classroom learning you will inspect these venues to study their site quality, presentation, ticket pricing, uniforms and staffing. The fitness industry has experienced a major boom. The strong emphasis on fitness in our curriculum has given our students a professional advantage as this industry continues to grow with careers like gym management and corporate fitness management. Experience working at sport functions for real clients as you manage the media, promotional material and sport personalities. Your real clients could include local communities, charities, government departments and private clients. You will experience every aspect of running a sporting event including our first ICMS Surfing Invitational in October 2016. Feel the adrenalin and excitement as students from several Sydney based universities and local year 12 high school students compete at our local beach in Manly. We have an impressive network of sports industry partners. These leading companies provide invaluable industry insight and experience to help shape our qualifications and ensure they are in line with industry best practice. When it is time to embark on your industry training, we work closely with them to find a suitable placement that is the best fit for your skills, interests and professional goals. 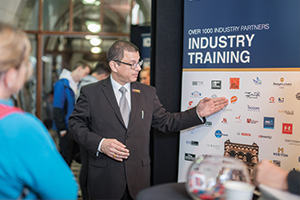 Your industry training could take you to a major city or regional area in Australia, or even an international city. Not only is this an invaluable experience, it is also a chance to grow your professional network. For many of our graduates this experience introduces them to their future employers. Constant striving to improve puts great strain on an athlete’s body and mind. New drugs, treatments, equipment, techniques and laws of the game, bring many new problems along with their intended improvements. In Contemporary Health Issues you will learn to identify these changes and to make management decisions when dealing with them. The psychology and wellbeing of an athlete can have a significant impact on their sporting performance. Understanding how sports psychology can influence the mental focus, confidence, injury recovery and mental and physical health of an athlete can make a big difference to how you work with them as a manager. In Sports Psychology Health and Wellbeing you will develop your understanding of the core principles or sports psychology. You will learn to identify an athlete with a sports-related psychology issue and write an intervention program to improve their wellbeing. A skilled sports manager must know how to motivate their athlete or team to strive for peak performance. Regular performance management techniques such as behavioral contracts and practical goal setting help the athlete and manager to each understand the professional expectations. From athlete assessment to setting long-term goals, you will learn how to manage and maximise the performance of athletes and teams. CMS took into consideration other attributes aside from grades for course selection. Course length: 3 years, may be longer depending on subjects selected. Includes up to 9 months of industry training which equates to a minimum of 900 hours.